Select Pagesetup in the Workbench datatypes list. Choose an existing Pagesetup to edit or create a new one. Go to the ColourKeys panel. Select the first plate you wish to have in the progressive, for example, Cyan. 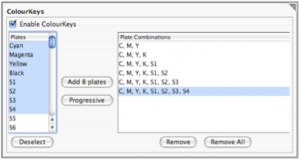 Click the Add 1 Plate button to copy the plate into the plate combinations list. Click the Progressive button to add the first plate and next plate in the list as a merged job. Repeat to continue adding the next plate in the list for whatever is required.